The New Year is approaching fast and I’m wondering where to invest my gaming energies in 2014. I won’t be doing another 12 Labours but I will be reviewing how well that went before the year is out. If there is one thing the Labours have taught me that is I can’t plan more than a couple of months in advance without getting seriously distracted! Bearing this in mind I’ve quite enjoyed getting onside with a club mate’s philosophy of sticking with a system for an extended period to get the most from it. 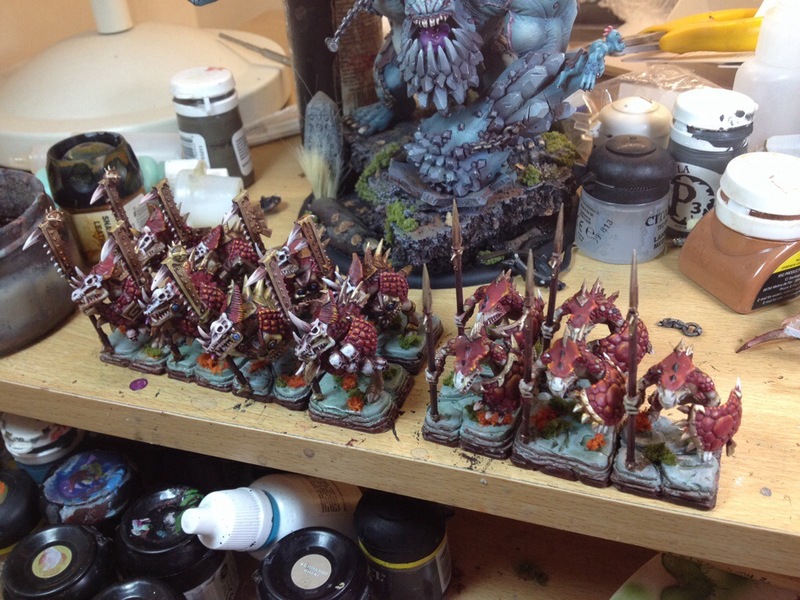 I’m thinking 2-3 months seems optimum : enough time to thoroughly learn the rules, paint a force and try out a few variations. 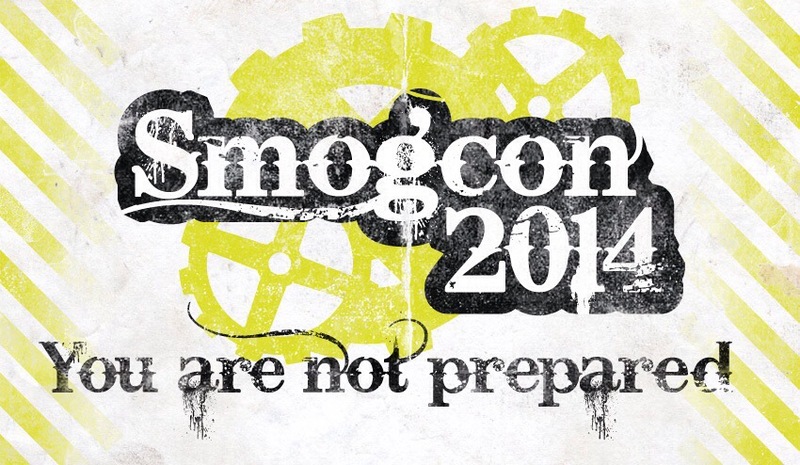 One thing is for sure : Smogcon in Feb. 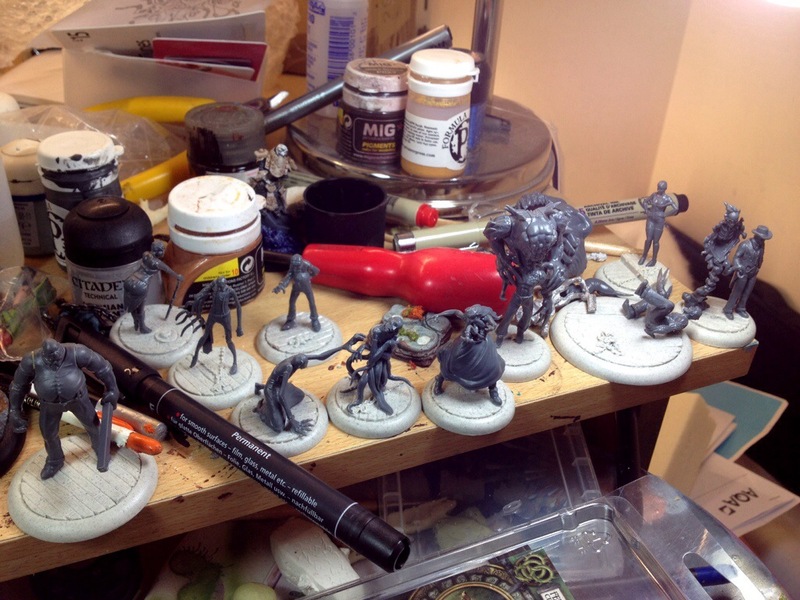 The main focus here is Warmahordes of course, but Malifaux, DZC and Bushido may also be worthy distractions. And then there is the speed painting which really needs a bit of practice too – even if just for a laugh. So, in conclusion, Jan and Feb will see me keeping Warmahordes firmly in mind. However, I would like to go to Smogcon in a good position to play one of the other systems to a respectable standard too. More work on Mr Lynch and his crew today. Having reviewed the first Illuminated I decided to put more contrast into the blending. I also decided to pop his head off and make a more dynamic pose. While I was at it it made sense to add some gribbly tentacles to his mouth too. I also had a go at another Illuminated. This guy was stood on tip toes and I just don’t see how this is practical for a gaming piece. I snipped off his feet and pinned him to a base. More tentacles should give a firmer connection with the base and add to the feeling this chap is being overwhelmed by ‘brilliance’. Feeling quite inspired about Jacob and his buddies so I cracked on with the models this evening. I’ve looked around the net and the general consensus seems to be that ‘brilliance’ is best portrayed as a blue glowy effect. I’m happy to go with that. 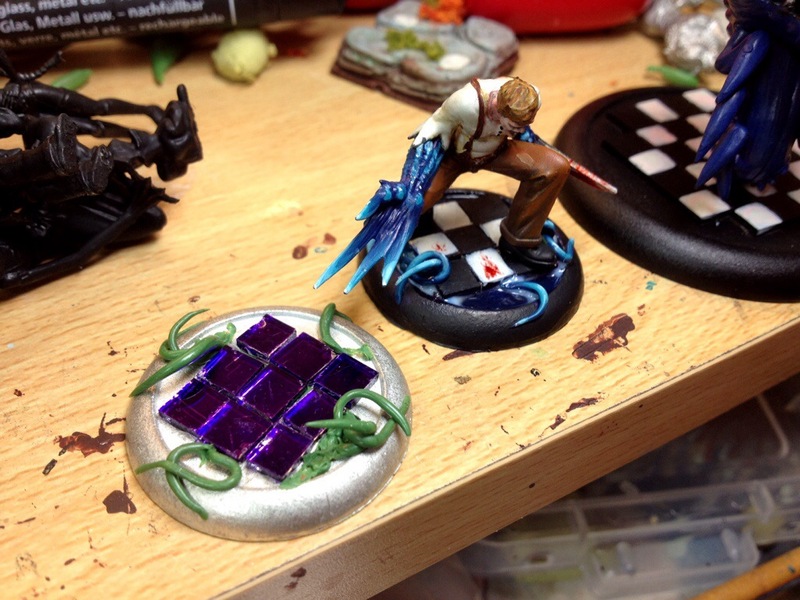 I also wanted a set of bases that suggests a nightmarish theme or the floor of a casino. I’ve seen a chequered effect used to great effect in the past so decided to go with this. I’ve also green stuffed a few writhing tentacles to represent ‘brilliance’ spilling out. The first model is an Illuminated. Not a bad model. It’s a shame he is crouched over as it obscures some nice detail on his face and shirt. I’m pretty pleased with the way he has turned out although I want to have a good look at him in sunlight with fresh eyes. 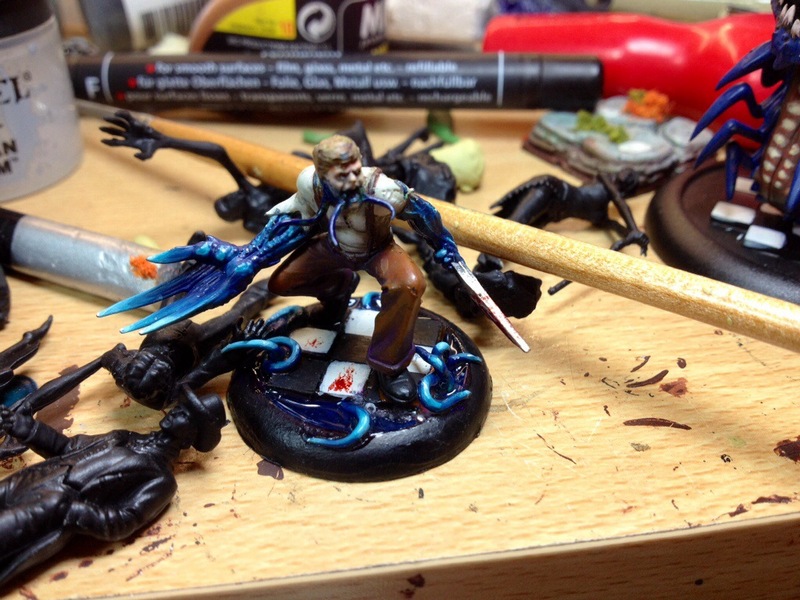 I’ve splattered a little blood on his base and weapon which is always a risk but I think it contrasts well with the blues of the ‘brilliance’. I’ve also started on ‘Huggy’. Just a base of Mordian blue and his teeth done so far. 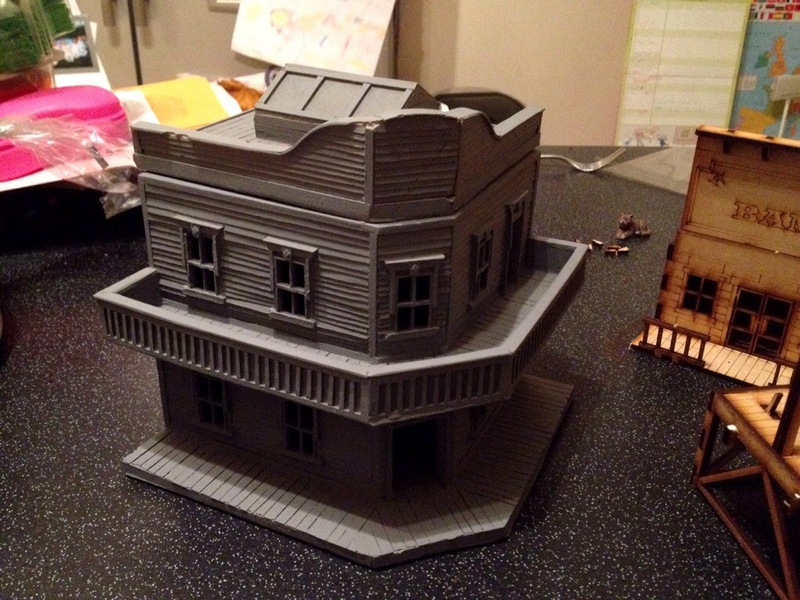 It’s a crazy model – I can’t decide if I love it or hate it! 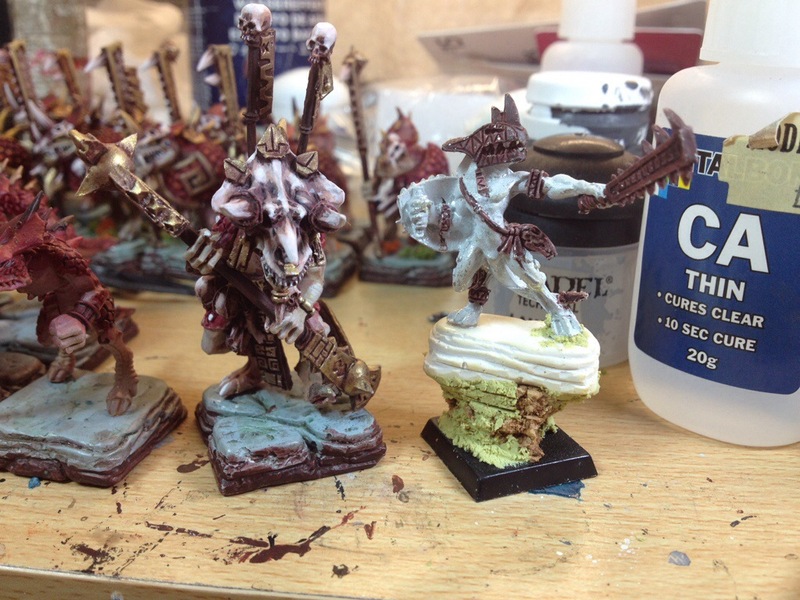 As for the plastic sculpts there are some exquisitely crafted details and the sculpts are very characterful. 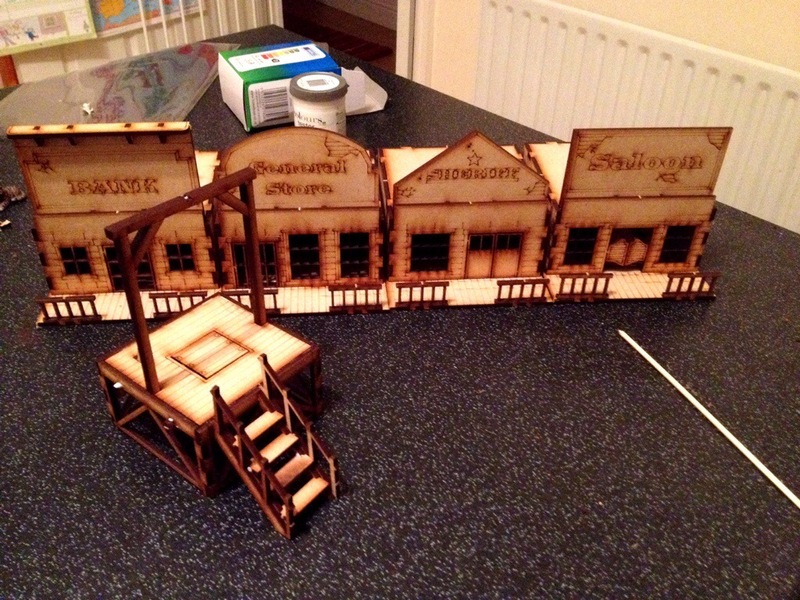 No 32mm Warmahordes or GW here – these look and feel like lean 28mm miniatures. I think they are nice but there are some areas that feel a little underdone. Overall I think they have a different feel to the rest of the stuff commonly seen on the market at the moment. I’m keen to give Malifaux 2nd edition a go. I briefly played a 1st edition McMourning Crew and although I enjoyed the game and the fluff Warmahordes has become my skirmish game of choice. The one frustration I had with McMourning was the very contrived winning strategy of killing my own Canine Remains then spinning round twice and saying wibble during a full moon in order to turn it into a a Flesh construct. Not strictly true of course but there seemed to be a lot of bizarre hoop jumping required to get the crew to a competitive state. 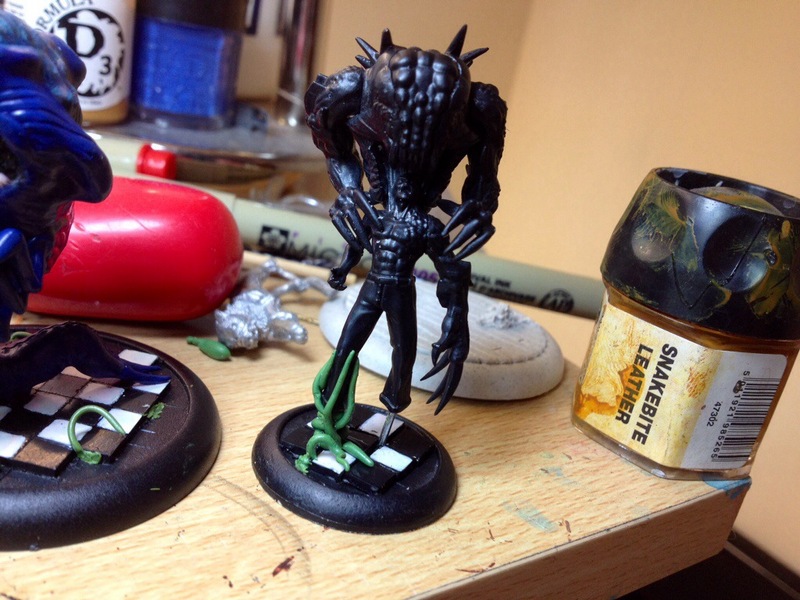 I’m hoping this sort of nonsense won’t be a prominent feature of Malifaux 2.0 but just in case I’ve decided to put the Ressers aside for now and try a different crew. 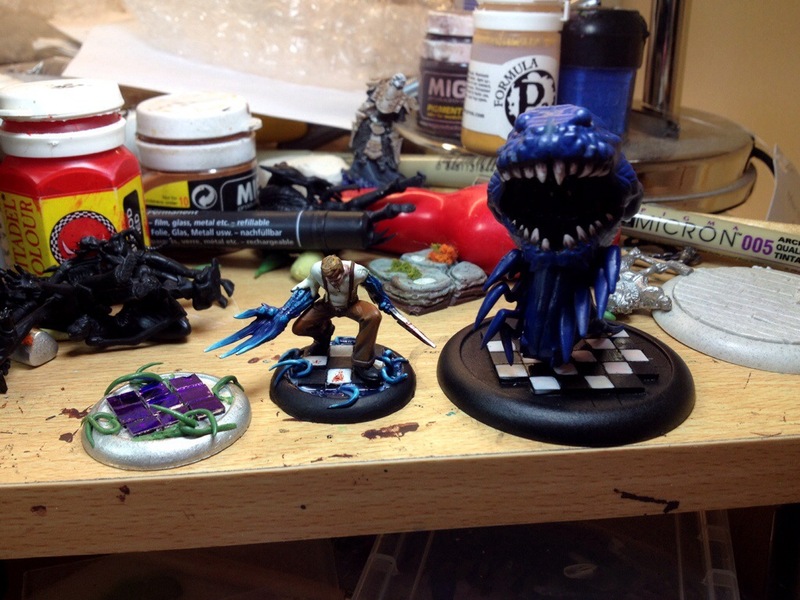 1) I’m keen to try the new Malifaux plastic range. 2) I quite like his fluff as an enigmatic and lucky card shark with his gang of criminal misfits. 3) His crew include foxy ladies and gribbly monsters. Result! 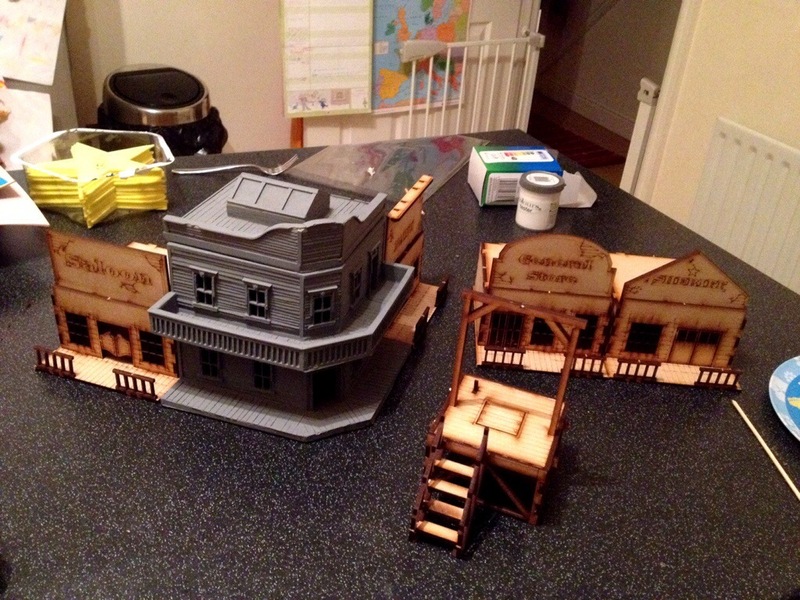 4) I have a nice resin Wild West hotel squirrelled away so this would be a good opportunity to do some cool terrain. So, there we go Jacob Lynch crew on the way.